Q: Yesterday, at the United Nations, the DPRK Foreign Minister raised the possibility that the DPRK may conduct a hydrogen bomb test in the Pacific Ocean. What is your response to this? A: I would like to state China's stance once again. The current situation on the Korean Peninsula remains highly complex and severe. The relevant parties should exercise restraint and commit themselves to de-escalating the situation instead of taking mutually provocative actions. We believe that all the relevant parties should undertake their due responsibilities and work for the shared goal. Only by doing this can we truly resolve the Korean Peninsula issue and realize the peace and stability of the Korean Peninsula and the rest of this region. This is in the common interests of the regional countries and the rest of the international community. Q: On September 20, the Chinese and ROK foreign ministers held a talk in New York. After that, the Chinese Foreign Ministry issued a readout saying that the ROK said it would keep its promise of not deploying tactical nuclear weapons on the Korean Peninsula again, which has been denied by the ROK foreign ministry. Can the Chinese foreign ministry confirm that is what the ROK foreign minister said? A: It is not the first or the only occasion recently on which the high-level ROK officials stated that it would not deploy tactical nuclear weapons on the Korean Peninsula again. This is public and out of question. Q: The Russian Sputnik news agency reports that Special Envoy of the Chinese Government on the Syrian Issue Xie Xiaoyan told journalists that China has the will and ability to proactively participate in the process of reconstruction of Syria, and the Chinese government encourages Chinese enterprises to be part of the reconstruction in Syria. But the Chinese side cannot accomplish the reconstruction by its own, and the regional and non-regional countries should make joint contributions. What is China's assessment of the current situation in Syria? Can you tell us more about China's conception for its part in the reconstruction of Syria? A: Recently, the situation in Syria has seen positive progress, as parties have reached consensus on setting up a fourth de-escalation zone and the counter terrorism operations are being advanced. 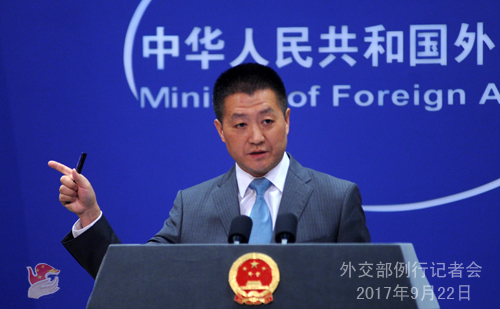 China hopes that the international community can seize the favorable opportunity at present, continue to support the UN's role as the main channel for mediation and promote new progress of the Syrian issue in terms of political process and ceasefire and secession of violence through the platforms of Geneva peace talks and Astana Dialogue. 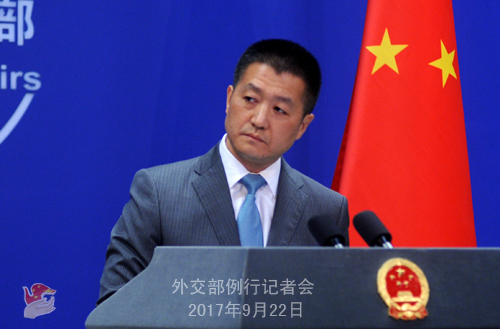 China stands ready to play a positive role in the reconstruction of Syria with the rest of the international community in the future. Q: Can you give us more details about the casualties of and the treatment and rescue efforts for the Chinese nationals following the earthquake in Mexico? A: I said the Chinese government has been closely following the security situation of the Chinese nationals in the earthquake in Mexico the other day. The Mexican side has confirmed to the Chinese Embassy in Mexico that three out of the five Taiwan compatriots trapped under the debris of the collapsed buildings in the downtown of Mexico City have been killed and the remaining two still missing. We deeply mourns the victims and extend sincere condolences to the bereaved families. By far, the rescue efforts are going on. 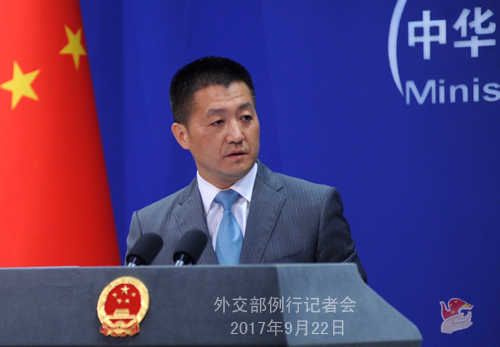 The Chinese Foreign Ministry and the Chinese Embassy to Mexico will continue closely following the development of the situation of the disaster and provide necessary assistance to Chinese nationals. Q: The US government has announced another round of unilateral sanctions against the DPRK. What is your response to this? A: I guess what you said refers to the executive order signed by President Donald Trump yesterday? (the journalist modded) If yes, I believe you know China's position. The Chinese side has always opposed the unilateral sanctions outside the framework of the UN Security Council. This position remains clear and consistent. Q: US President Donald Trump said in New York yesterday that the central bank of China has issued a notice to require all Chinese banks to stop providing financial services to new clients from the DPRK. Does that mean China will begin the sanctions against the DPRK? Can you give us more details? A: According to what I know, what you said is inconsistent with the facts. As a principle, China has always comprehensively and strictly implemented the UN Security Council resolutions and fulfill our own international obligations. Q: A meeting of Contact Group of Organization of Islamic conference was held on the sidelines of the UN General Assembly. All the members have expressed solidarity with people of Jammu Kashmir and urged the UN Security Council to implement its resolution on Kashmir. How does China view the outcome of this meeting? A: I have noted the relevant report. China's position on the Kashmir issue is clear-cut. The issue of Kashmir is an issue left over from the history. The Chinese side hopes that Pakistan and India can strengthen communication and dialogue and properly resolve the issue. This is conducive to jointly upholding regional peace and stability. Q: As to the question that was asked about the financial sanctions against the DPRK, you said it is inconsistent with the facts. Can you tell us what aspect was incorrect since there has been a lot of things said about this? A: Indeed, there has been various comments about the situation on the Korean Peninsula recently. The question raised by the journalist from Kyodo News Agency was very specific, and my answer was very specific, too. Q: The Chinese government has issued a guideline to ease joint venture and tariff restrictions on foreign automakers that build cars in China. Is that a concession to the Trump administration which is investigating Chinese trade practices? A: I am not aware of what you said. I would like to refer you to the competent authority. Q: On the Winter Olympics to be held in Pyeongchang, the ROK, next year, the French Sports Minister said yesterday that if France considers the security situation is not safe enough in the ROK, the French Olympic teams simply won't go to participate the Olympic Games there. Does China have the similar concerns at the moment? Is China considering not allowing its Olympic delegation to go and participate the Pyeongchang Winter Olympic Games next year? A: first, I have not heard about the remarks of the French side you mentioned. Second, as I know, the ROK side once said the Pyeongchang Winter Olympic Games will be held as scheduled. Third, we sincerely hope the regional situation can maintain peace and stability and be conducive to the normal exchanges of various kinds among the people. 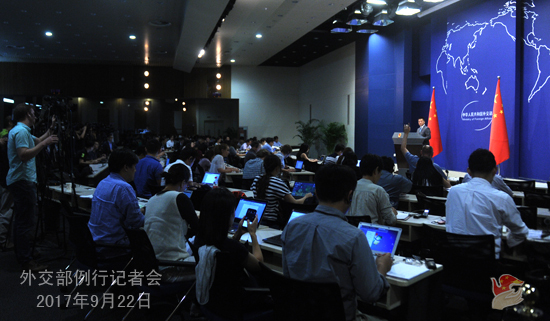 Q: Do you have any details about the Interpol General Assembly to be held next week in Beijing which senior Chinese officials will be attending? How does the Chinese government respond to the concerns from human rights groups that China is or could perhaps be abusing its position of having a Chinese national as the president of Interpol to pursue political aims in going after dissidents overseas? A: As to the information of its General Assembly, the Interpol has issued the relevant news about the holding of meetings. We will issue more information on the Interpol General Assembly in due course. As to the groundless speculation of certain so-called human rights organizations, I shall point out that Interpol is the world's largest international and intergovernmental police organization for police cooperation. The purpose of Interpol is facilitating the most extensive mutual support and cooperation among police of various countries to effectively prevent and fight crimes by following the principle of professionalism, neutrality and being non-political. The Chinese government has always strictly observed its purpose and principle and actively promoted the cooperation between Interpol and its members. Q: Following the comments from the DPRK Foreign Minister that their country could be considering a hydrogen bomb test in the Pacific, has China made any representations to the DPRK regarding this matter? A: China is opposed to the DPRK's development of nuclear weapons and nuclear test. This position is public and the DPRK is clear about it. The current situation on the Korean Peninsula is complex and severe. If all relevant parties sincerely want to effectively resolve the Korean Peninsula nuclear issue, realize the denuclearization of the Korean Peninsula and uphold regional peace and stability, what they need to do now is strictly and completely implementing the UNSCRs and actively explore the way to settle the issue through dialogue, rather than provoking each other and adding fuel to the fire. Q: There are reports that the Chinese banks have been instructed by the People's Bank Of China to stop doing business with the DPRK. Can you confirm this? A: The journalist from Kyodo News Agency just asked the same question. According to my information at hand, what you said is inconsistent with the facts. Q: Australia is overhauling laws on espionage and foreign political forces amid mounting concerns about Chinese influence in Australia's democratic processes. Does China have a comment? A: My colleagues and I have stated our views many times with regard to this issue. We hope the relevant party should be responsible and well-grounded when making remarks. Q: The DPRK leader Kim Jong-un has issued a statement to fight back the address by President Donald Trump. What's your comment on this? A: In fact, China has commented on the Korean Peninsula nuclear issue and the recent remarks of various parties many times, and I believe you are very clear about that. As to some somewhat individual remarks by the directly concerned parties, the Chinese side never makes comments. Q: Do you mean that what President Donald Trump said yesterday is in consistent with the facts? A: I would like to reiterate to you that: first, according to my information, what you said just now does not conform to the facts. Second, China has always strictly and accurately implemented all the Korean Peninsula nuclear issue-related Security Council resolutions that impose sanctions on the DPRK.